First edition of the first lady Barbara Bush’s memoirs. Octavo, original half cloth, illustrated. 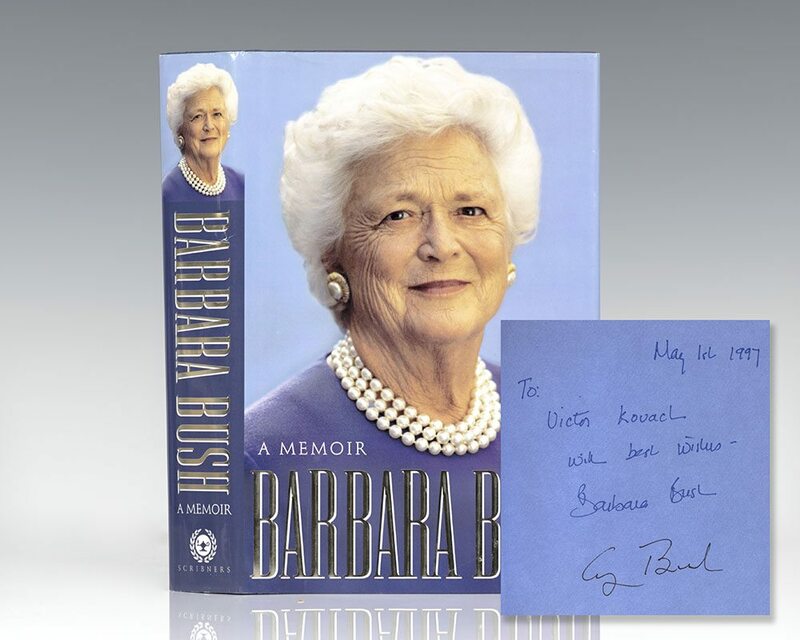 Signed by George H. W. Bush and inscribed by Barbara Bush on the front free endpaper, “May 1st 1997 To: Victor Kovach With best wishes – Barbara Bush.” Near fine in a fine dust jacket. Jacket design by Jackie Seow. Uncommon signed by both the former first lady and President Bush. The former First Lady recounts the exciting and often poignant events in her life, from her secret engagement to George Bush, to the loss of her three-year-old daughter to leukemia, to daily life at 1600 Pennsylvania Avenue.